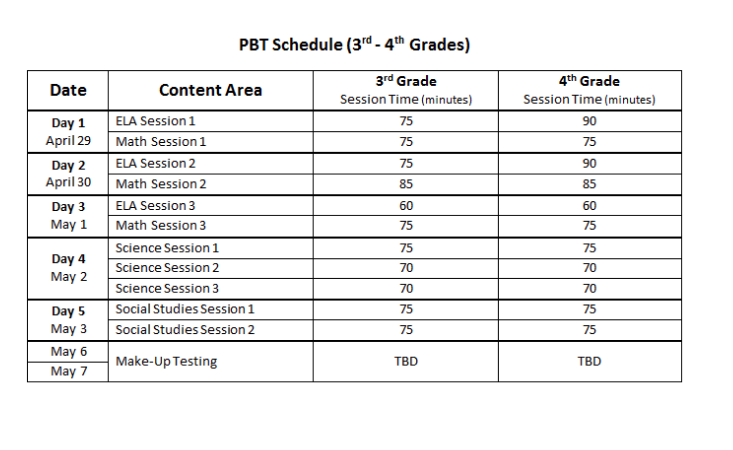 3rd & 4th Grade Students will take a paper-based test (PBT). 5th Grade students will test online. How will accommodations for students with IEPs and IAP/504 Plans at BRCVPA be handled? All accommodations and modifications will be followed as stated on the individual child's IEP or IAP/504 Plan. How much time will my child have to take the test? If you look at the test administration schedule posted above, you will see the time allotments for each test and subject. These reflect an approximation of the time it would take the average tester to complete plus half. For example: if the average tester could complete a test in 60 minutes, the students would receive 90 minutes. How do we know if our child needs LEAP tutoring? All children can benefit from tutoring. For the students who are already on-level, tutoring would focus on boosting their performance above the Mastery level. Tutoring for students who are below-level would focus on closing the gaps and pushing them beyond Basic. One indicator of need could be your child's performance on last year's assessment. If their score was Basic or below Basic, they might need extra help. BRCVPA teachers are already embedding test preparation strategies into their instruction regularly. If you do not know whether or not your child needs additional tutoring, please contact their teacher. If my child is already enrolled in Extended Day, will there be an additional fee for tutoring? No. The fees for tutoring and extended day are exactly the same. If you sign your child up for tutoring, and they are already in extended day, there is no additional cost. What are the achievement levels, and what do they mean? How can I help my child at home to prepare for testing? Check to make sure they are completing their LEAP Packets. After they finish, discuss their answers, the strategies they used, and ask them to justify their responses to you based on what they read in the passage, or based on what they know about math. You would be surprised how these conversations help students synthesize and deepen their understanding of the content. Encourage your child to problem-solve! Some of those grocery-store situations and mental calculations that come naturally to you would be rich real-world learning experiences for your children. Let them estimate/calculate how much you'll save if an item is 40% off, or if those 3 for 1 deals are worth it. If you're having a party with a certain number of guests, how many packs of cups, plates, and forks will you need. These are the types of problems they will be solving on the test, so help bring them to life! Have your child discuss what they are reading with you. Even if it's a magazine article or the side of a cereal box. Reading comprehension touches every aspect of their lives, so those discussions will help them become better readers and test-takers! Make sure your child is getting enough sleep at night. We have all heard it a million times, but it's true! Something as simple as enforcing a consistent bedtime can make a huge difference in your child's success during school, and during testing week. The National Sleep Foundation Recommends that school-age children get between 9-11 hours of sleep per night. Click here for a neat infographic, and click here to read more about healthy sleep habits for school-age children. Stay calm and positive! Children pick up on our anxieties, and will develop negative associations with school and testing if they sense them from us. Staying positive will help your child to focus on what is really important: LEARNING! ​For more parent tips on standardized testing, click here! Math practice: The Department released practice problems for teachers to use with their students. These problems include sample student answers for parents and students to check their work from. Eureka math parent guides: These guides help parents of students using the Eureka Math series of better understand the content of each unit of instruction. PARCC Online website has tons of links to parent resources! Study Island is packed with LEAP-like questions. All BRCVPA 3rd-5th Grade STudents have a login and password. MobyMax: your child has a username and password to MobyMax through school. This is a great place for online-test prep, and includes Reading, Math, and Science!